Remember your friend's birthday through these printable birthday cards that feature a mouse holding a happy birthday buddy banner in calming yellow and pale peach background color. Print these free printable cards on a hard paper then fold it in half. Write your special message inside and make sure to put a smile on the face of the celebrant by including a special joke to cheer him or her up on that special day. This mouse is certainly sneaking off to have some fun somewhere and seems to be inviting everyone to do the same, so have a good time on this special day and make sure your friend will to. Print this card out today! Our popular humorous mouse is back. Same card only an added bonus. Buddy has been added to the banner. He is looking rather nonchalant as he crosses the bright yellow front cover. But, rest assured you are being very serious about someone's special day when you send only these free printable birthday cards to all on your birthday card list. 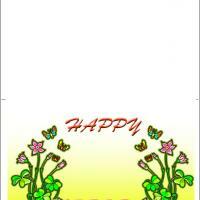 Our one-of-a-kind top quality designed cards all offer an easy free customizing feature. 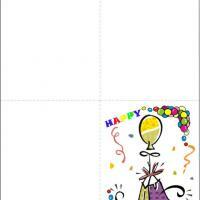 It conveniently allows you to personalize the birthday greetings with images and words of your choice. 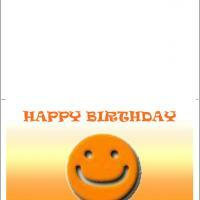 Be a buddy and send Mouse With Happy Birthday Buddy Banner. Want to say it in a subtle way? 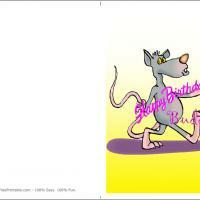 Have a large Mouse With a Happy Birthday Buddy Banner say it for you. The cover features the return of our popular sly mouse. The hot pink happy birthday lettering stands out well against his gray fur. The inside covers are blank because we know you will also love our custom print feature to include those personal words you so want to share to let them know you care. There is someone on your list who will appreciate this mouse's sly look on his face as he carries your greeting across the front of the card. 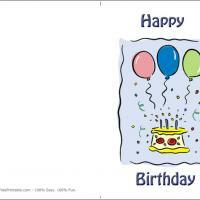 So, surprise someone on your birthday card list today with one of these free printable birthday cards.